Stephen Seckold, who this year offered Ashley Chan, a graduate from Marist Sisters’ College Woolwich an apprenticeship, says Ashley has the talent of the celebrity chef who was once a contestant on Masterchef and is now a TV star and owner of the Sydney-based restaurant Billy Kwong’s. Mr Seckold, who has worked in the industry for 17 years, currently has four apprentices on staff, but says that they only offer jobs to a select few. It didn’t take long for Ashley to secure a job. The 18-year-old completed at school five work placements (70 hours) at A La Carte restaurants like the Deckhouse, Doyles, before landing full-time work at the Flying Fish in January this year. 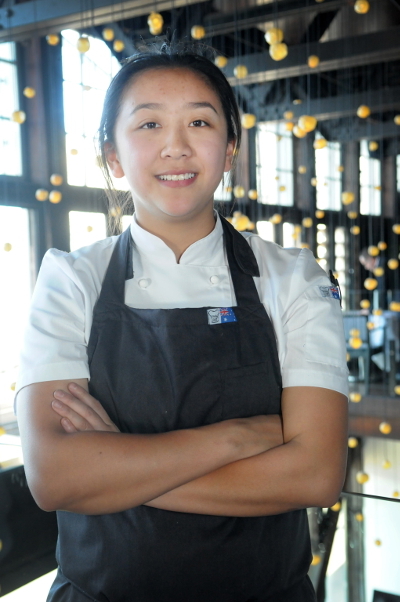 She is now a second year apprentice, already running service in the raw bar (cold kitchen), and has mastered the restaurant’s signature dish the seared yellow fin tuna, con fit pork belly with pink grapefruit. Next year, she will be training other apprentices and will be able to become a qualified chef in two years thanks to studying the extensive VET subject of Commercial Cookery at the Southern Cross Catholic Vocational College (SCCVC) Burwood one-day a week, while continuing Hospitality and her other HSC subjects at Marist Sisters’ College. For Ashley, who grew up making dinner for her parents for six years during high school, cooking has always been fun and in the family. Ashley, who loves working with seafood because she grew up fishing, now has the pleasure of cooking for her family and friends at the Flying Fish, after securing a full-time apprenticeship.